The event also witnessed of a short march and a stand-up performance. The setlist included ‘6th of June’, ‘Battle of the Somme’, ‘Sare Jahan se Acha’, among other songs. The last song received a rousing response. 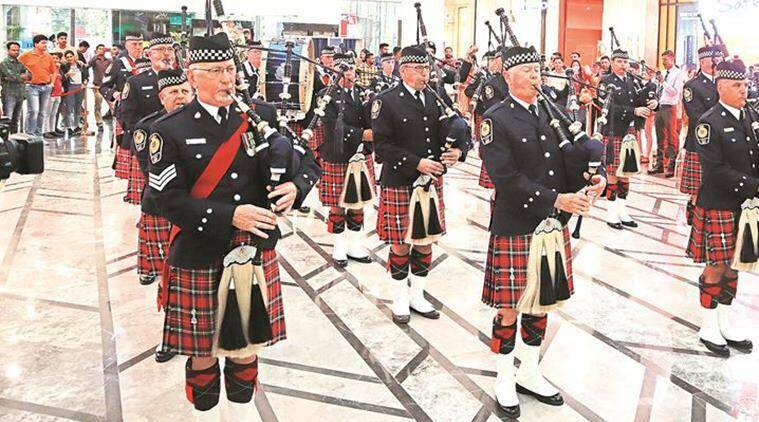 The famous Vancouver Police Pipe Band (VPPB), the official band of the city of Vancouver, Canada, delivered a 25-minutes performance at the Elante Mall, Chandigarh on Tuesday evening. The event was organised by Consulate General of Canada. Formed in 1914, the VPPB has now become one of the most respected police bands in the world. They perform across the globe. Apart from entertaining people with their musical skills, they also serve as regional ambassadors. They create and spread awareness about Vancouver’s cultural history. “The band members volunteer their time to build relationships between Vancouver Police and the community”, explains Cal Davis, the pipe major of the band. “Known for being ethnically diverse, the Vancouver Police Department has a growing number of Punjabis in its fold. The department’s band performs at various events for the Punjabi diaspora, including the annual Baisakhi Parade of Vancouver”, says Davis. The band is on a cultural tour of India and has already performed in Delhi, Amritsar, and Nawanshahar. The band comprises of 34 members, of whom, 24 have come to India to perform. The band also has a few Indian members like Constable Suki Sunger. In Amritsar, they visited Jallianwala Bagh to commemorate 100 years of the massacre. The performance in the city was the last one of their tour. “We have been quite honoured by the amazing response we have received for each of our performances. We are truly humbled by the respect people have showered on us throughout our tour,”says Davis.